With apologies to heart-shaped boxes of chocolate everywhere, it's clear that donuts are a vastly superior treat. Especially if we're talking about that cheap box you picked up at CVS before work because, you know, you forgot about Valentine's Day. The decadent donut doesn't come in the shape of a heart, however. It's a square topped with chocolate icing and crumbled pie. Inside, it contains cookie dough-flavored filling and brownie batter-flavored butter créme filling. They're having a party inside a pastry and you're invited. Additionally, for a limited time, you can pick up a 10-count box of Munchkins for two bucks. It'll help fill the tiny chalk-dust lined hole in your heart left by this year's dearth of Sweethearts. If you don't have a Dunkin' nearby, Tm Horton's will be doing something similar. 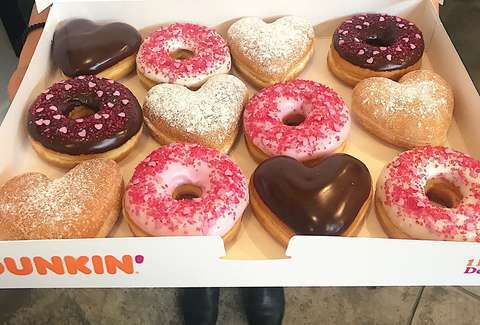 It has heart-shaped donuts it's calling the Vanilla (filled with raspberry jam) and Chocolate (filled with Venetian cream) Be-Mine Donuts. February is a truly magical month if you like your breakfast dessert served in a charming shape.